Actually it's not, it's quite sweet...and tangy. But it doesn't have the quite the same ring to it does it? :) But you could definitely make it spicy! This whole meal comes together in about 20 minutes, it's quick to prep and you can have veggies, rice (or pasta), and the sauce cooking at the same time the meatballs are cooking, then everything finishes at the same time and just needs to cool. In a medium bowl, combine ground beef, egg, breadcrumbs, onion, salt & pepper. Mix with a fork or clean bare hands until very well combined. By hand, form into 1” meatballs, Place meatballs in a single layer on a cookie sheet and bake for 15 minutes. Meanwhile, in a medium saucepan, combine the garlic, ½ cup of water, the ketchup, honey and soy sauce. Bring to a boil over medium heat. Lower the heat and let simmer for about 5 minutes. Now stir the cornstarch into the remaining ¼ cup water and add to the sauce. Stir, cover the pot and let cook for another 15 minutes, stirring once in a while. 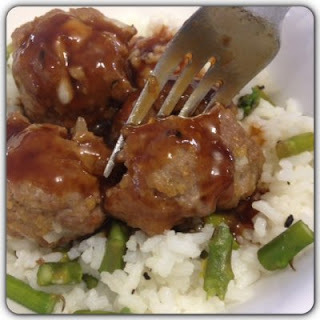 Serve over meatballs and rice, pasta or couscous. Click here to view a PDF of this recipe.